1b. Does A(ab) logically imply not-E(ab)? Example: From the truth of "All men are sinners," one can state as a necessary consequence that it is false that "No man is a sinner." 1c. Does A(ab) logically imply not-O(ab)? Example: If "All men are mortal" is true, then the contradictory, "Some men are not mortal" is false. 1d. Does Not-A(ab) logically imply O(ab)? Example: If it is false that "All men are saved," then the contradictory, "Some men are not saved," is true. 2a. Does E(ab) logically imply O(ab)? 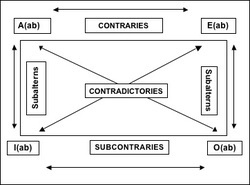 Example: If it is true that "No hater-of-logic is a lover-of-truth," then the corresponding O form is also true. 2b. Does E(ab) logically imply not-A(ab)? Example: If it is true that "No man is saved by his own efforts," then it is false that "All men are saved by their own efforts." 2c. Does E(ab) logically imply not-I(ab)? Example: If "No man is saved by his own efforts" is true, then it is false that "Some are so saved." 2d. Does Not-E(ab) logically imply I(ab)? Example: If it is false that "No men are saved," then the contradictory, "Some men are saved," is true. 3a. Does I(ab) logically imply not-E(ab)? Example: If it is true that "Some persons are Christian," then it is false that "No persons are Christian." 3b. Does Not-I(ab) logically imply E(ab)? Example: If it is false that "Some sinners are saved by their own efforts," then the contradictory is true: "No sinners are saved by their own efforts." 3c. Does Not-I(ab) logically imply O(ab)? Example: If it is false that "Some sinners are saved by their own efforts," then it is true that "Some sinners are not saved by their own efforts." 3d. Does Not-I(ab) logically imply not-A(ab)? 4a. Does O(ab) logically imply not-A(ab)? Example: If it is true that "Some persons are not Christian," then it is false that "All persons are Christian." 4b. Does Not-O(ab) logically imply A(ab)? Example: If it is false that "Some persons are not mortal," then the contradictory is true: "All persons are mortal." 4c. Does Not-O(ab) logically imply I(ab)? Example: If it is false that "Some persons are not mortal," then it is true that "Some persons are mortal." 4d. Does Not-O(ab) logically imply not-E(ab)? Example: If it is false that "Some persons are not mortal," then it is false that "No persons are mortal." Repetition does have benefits. The student should test each of the sixteen inferences for validity by using the circles and lines of Chart 2.1. By so doing, the student will not only gain practice using the diagrams and lines of the chart but acquire skill for determining the validity or invalidity of inferences. For example, Assuming A(ab) is true, what can be said about the truth-value (truth or falsity) of E(ab)? The lines (on the Chart) A and E do not overlap. What does this mean? Answer: Whenever this condition holds, it means, A and E cannot both be true together. Thus, if A(ab), All a is b is true, the circles of Cases 1 and 2, then E(ab), No a is b, is false, that is, the circles of Case 5 do not obtain.